Players: DO NOT TRY TO ORDER YOUR UNIFORM UNTIL YOU RECEIVE AN EMAIL WITH A LINK AND INSTRUCTIONS. IF YOU ORDER BEFORE YOU ARE ASSIGNED A NUMBER YOU COULD POSSIBLY ORDER THE WRONG ITEM AND CUSTOMIZED UNIFORMS ARE NON-REFUNDABLE. BSC Uniforms are on a 2 year cycle beginning Fall 2018. Academy numbers change with the new uniform cycle. Starting with #1, as players register they will be assigned the next number in line so that numbers are not duplicated. Academy players are not going to be assigned numbers by birth year anymore; instead we have one soccer.com roster for boys and one for girls with no number duplications occurring within either roster. Academy numbers do not transfer to select. When a player starts the select program they are issued a new number. Once a player is assigned a number for select, they will keep this number as long as they stay registered in the select program with BSC. 2018-19 Players: DO NOT TRY TO ORDER YOUR UNIFORM UNTIL YOU RECEIVE AN EMAIL WITH A LINK AND INSTRUCTIONS. IF YOU ORDER BEFORE YOU ARE ASSIGNED A NUMBER YOU COULD POSSIBLY ORDER THE WRONG ITEM AND CUSTOMIZED UNIFORMS ARE NON-REFUNDABLE. Congratulations on being a part of BOERNE FC THUNDER. BOERNE FC THUNDER is proud to partner with SOCCER.COM to supply your uniforms and all the gear you need to start the season. BOERNE SOCCER CLUB has set up the roster for your team. Request for a change of # will not be allowed. Your club uniform page is set up with all your required items. In addition to your uniform, represent your team off the field with BOERNE FC THUNDER Spiritwear. Save on the sport you love with the SOCCER.COM Goal Club. Check out the largest selection of cleats, shin guards, balls, and more at SOCCER.COM. 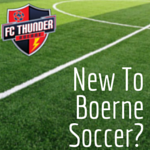 BOERNE FC THUNDER and SOCCER.COM have worked together to provide deep discounts and tremendous value on your order. Due to the negotiated low pricing, some SOCCER.COM promotions will not be valid for your Club uniform order. Be sure to add SOCCER.COM to your address book to make sure you don't miss exclusive offers. If you need help with your SOCCER.COM order or have questions, please don't hesitate to contact SOCCER.COM at custserv@sportsendeavors.com, or call 1-800-967-8326. Good luck on your upcoming season... Go FC THUNDER! Academy & Select Uniform Link to use only after a # has been assigned. Click on “Spirit Wear & Uniforms” tab on the left side of home page. Select your team in the drop down menu. This will be the year your child was born. Select your players name in order to see all of their required gear.